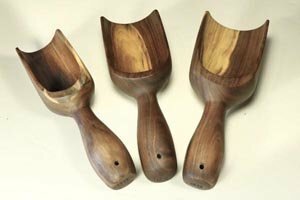 Turning wooden scoops can be an interesting and fun project for people who enjoy woodturning. 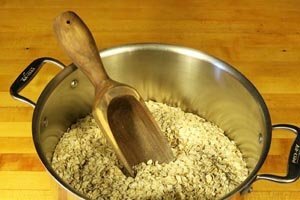 Scoops can help speed up transferring items like rice, flour, sugar, birdseed, etc. Scoops make excellent presents and when priced appropriately, they can be quick sellers at art and craft shows. 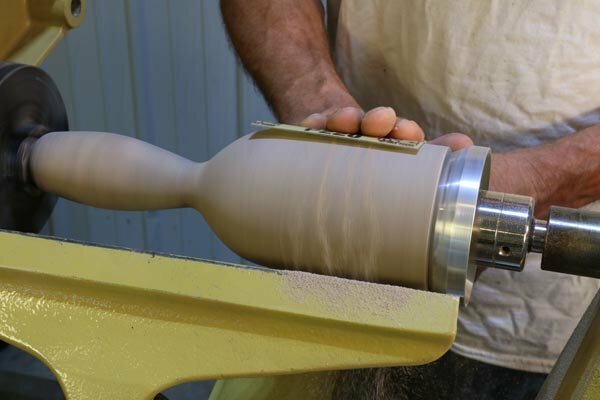 Smaller blanks can be used to create smaller scoops. Steps to Making Wooden Scoops on a Lathe. Step 1. Attach a faceplate to the blank using screws. Step 2. 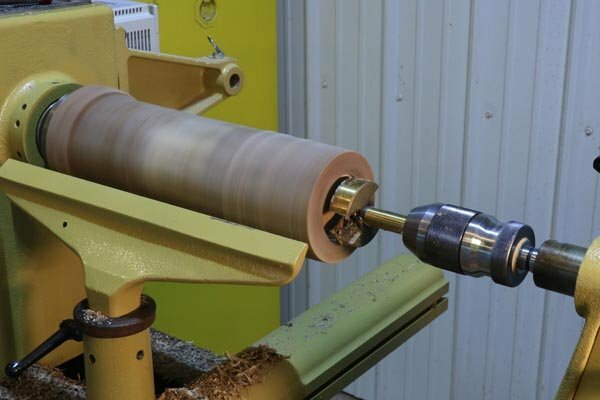 Mount the blank on a woodturning lathe. Step 3. Turn the blank to a round cylinder using a bowl gouge. Step 4. 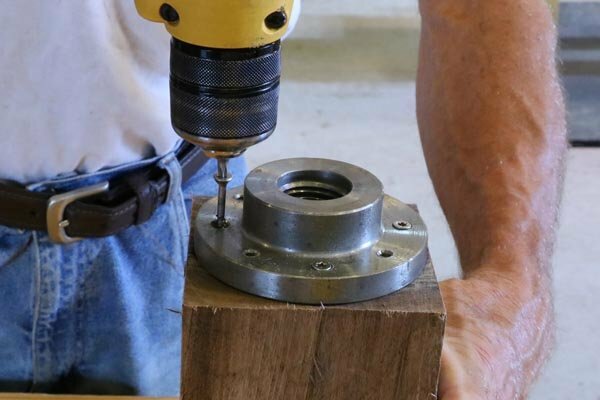 Bore a hole using a Forstner drill bit. Step 5. 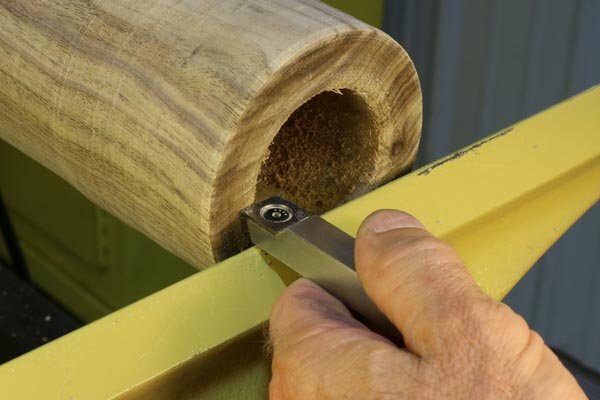 Expand (optional) the size of the opening using a carbide cutter. Step 6. Turn the exterior of the scoop using a live cone-shaped center for additional support. Step 7. Use a parting tool to remove and let the scoop dry (if using wet wood). Step 8. 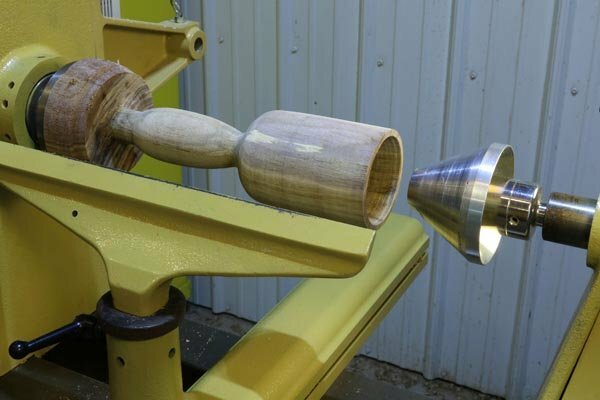 Remount the scoop using a scroll chuck. Sand the interior of the scoop. Step 9. Sand the exterior of wooden scoop. Step 10. 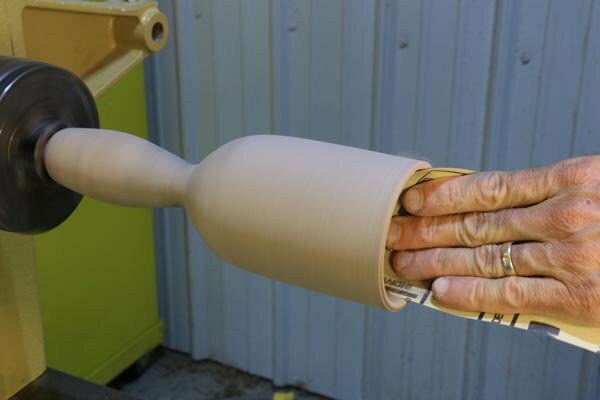 Add decorative grooves (optional) to the handle. Step 11. Remove the top portion of the scoop using either a bandsaw or a disc sander. Step 12. 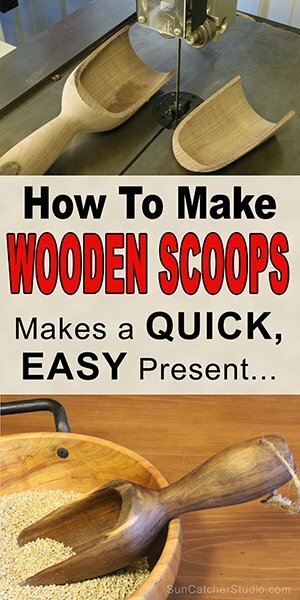 Watch the wooden scoop take form. Step 13. 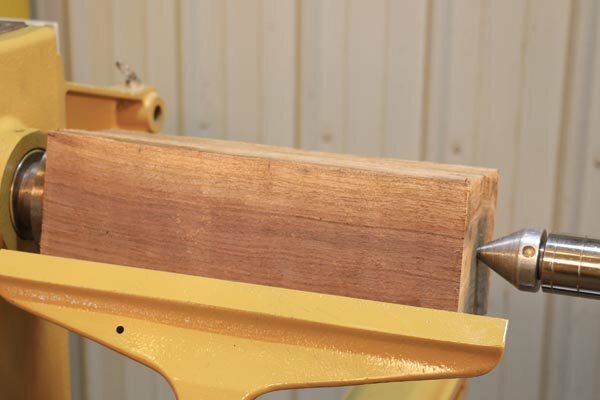 Round corners of scoop, remove excess tenon on bottom, and finish. 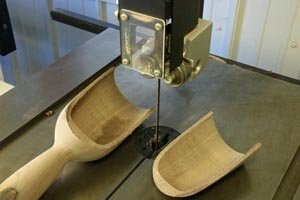 While there are numerous ways to turn a scoop, I typically take the following steps. I first attach a faceplate to a blank using screws (Step 1). I have found a faceplate will more securely hold a blank in comparison to a scroll chuck. Next, I mount the blank on the lathe using the tailstock for additional support (Step 2). I then use a bowl gouge to round the blank into a cylinder (Step 3). Next I begin boring out a hole approximately 4” (10cm) deep using a Forstner drill bit (Step 4). Since my biggest Forstner bit is only 2¼” (6cm), I typically use a square carbide cutter to increase the opening (Step 5). A round carbide cutter is used near the bottom. 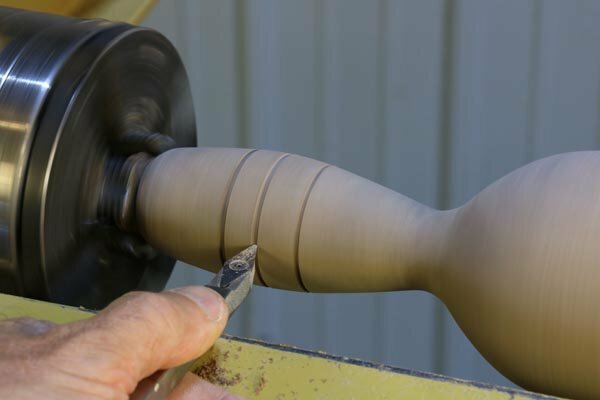 Next, I finish turning the exterior using a bowl gouge. During this process, a cone-shaped live-center in the tailstock helps provide additional support (Step 6). 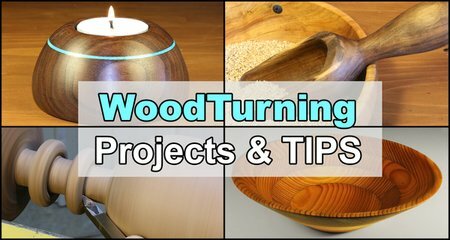 If using green wood, I create a tenon on the end of the scoop and then use a parting-tool to separate the scoop from the waste block (Step 7). 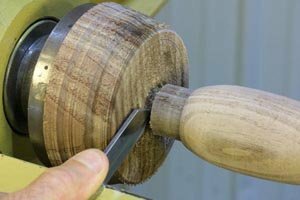 After slowing drying for several weeks or months, I remount the scoop on the lathe using a scroll chuck and sand the interior (Step 8). Next I sand the exterior, again using a live cone-shaped center for additional support (Step 9). After sanding the handle, I may add decorative grooves (Step 10). 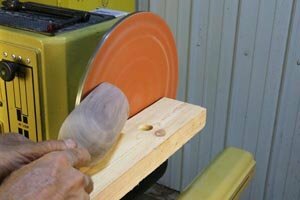 Next, I remove the top portion of the scoop using either a bandsaw (Steps 11 and 12) or a disc sander (Step 13). 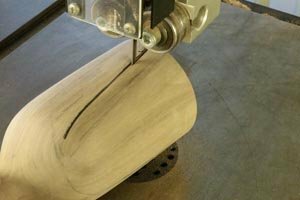 If using a band saw, it is recommended to use a clamp or jig to hold the round stock so it cannot roll while cutting. A disc sander can also be used for creating rounded corners and removing the excess tenon on the handle (Step 13). The finished scoop ready for use (Step 14). excellent idea. I hope you don’t mind if I use it. Anthony, thanks for the kind words. 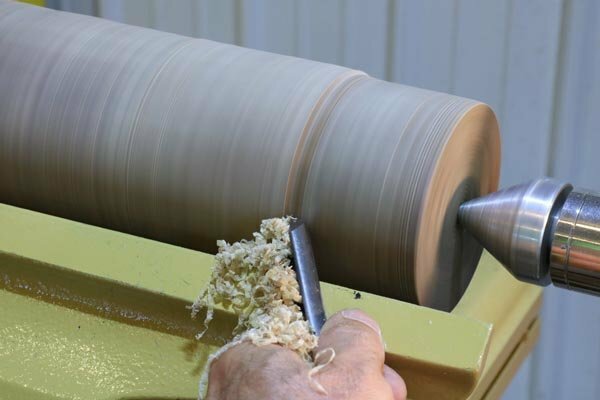 I hope you are at your lathe right now making a scoop! I believe those are the best instruction I have ever read. I will be using them this week. THANK YOU!! !